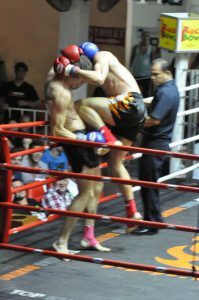 Five stitches is a small price to pay for last night’s victory in Patong, according to Tiger Muay Thai and MMA training camp, Phuket, Thailand fighter Jamie “Milkman” MacKinnon. 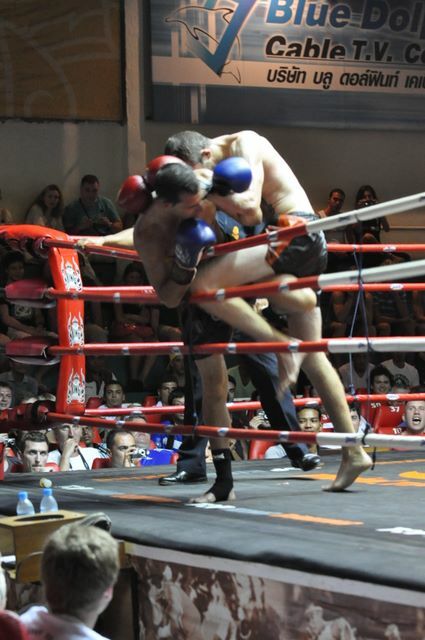 Although his French opponent, Manu, landed a strong elbow cutting his head in the first, MacKinnon applied so much pressure in the second that the other fighter simply couldn’t carry on. The win moves MacKinnon’s record to 9-1 – something he attributes to his excellent training at Tiger. Not so lucky in last night’s battle was TMT fighter Jimmy Allan Irvine. He took a strong knee just above the groin, followed by a knee to the face during the third. Opponent Richie Green took the TKO, but Irvine kept up his optimism.